All living organisms need energy and matter from their environment. Matter is needed to make new cells (growth) and to create now organisms (reproduction), while energy is needed to drive all the chemical and physical processes of life, such as biosynthesis, active transport and movement. 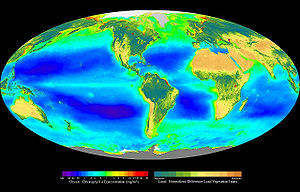 Phytoplankton with a world production of around > 30 x 10*6 t C-1. The recently “rediscovered and stipulated unforeseen crop of the future”: the seaweeds. On a global scale around accounting for their patchy distribution a world production of around 2.55 x 10**6 t C-1. “Common” terrestrial C3 & C4 crops. From Figure 1 we can see that ≈ ⅔ of our globe is ocean, which emphasizes the urgently need to have reliable primary production data of the terrestrial as well as the oceanic primary production processes. Photosynthesis not only directs to the “flux” of solar energy into Earths ecosystems via the food chain. But it also implies its temporarily fixation as carbon in all organic compounds within organisms’ bodies. In ecological terms speaking a “food-chain pyramid”. In all, photosynthetic organisms convert around 100-115 petagrams of carbon into biomass per year. Based on the assumption our primary production as green biomass has to grow with around 70% for the ≈9.2 billion people at the midst of the 21st century 80 petagrams of seaweed carbon needs to be produced.